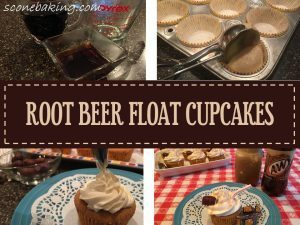 If you love Root Beer Floats, you’ll love these Root Beer Float Cupcakes. 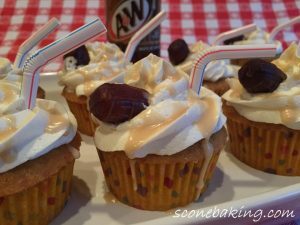 These cupcakes have a wonderful root beer flavor. 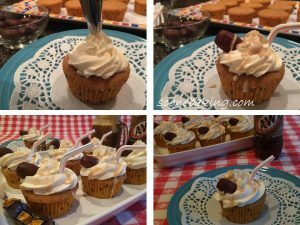 I tried just reducing down the root beer, but that didn’t give me enough root beer flavor in the cupcakes, so I added Watkin’s Root Beer Concentrate (not extract), which gave these cupcakes that wonderful root beer flavor. Because these are Root Beer FLOAT Cupcakes, I made a Vanilla Ice Cream Buttercream Frosting, which I piped on top of the cupcakes to look like soft serve ice cream. Preheat oven to 350º F. Prepare muffin tin with paper liners. Whisk together both flours, baking powder, and salt in medium bowl; set aside. 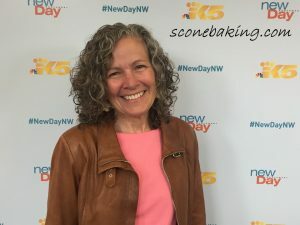 In a stand mixer fitted with paddle attachment, cream butter and sugar for 3 minutes; add eggs, one at a time on low speed until incorporated. Mix in root beer concentrate (I tried these without the root beer concentrate, but they didn’t have enough root beer flavor. I prefer root beer concentrate over root beer extract). On slow speed add flour mixture and 3/4 cup of reduced root beer, alternating 1/2 each at a time. Beat on slow speed until just combined. Scrape down sides of bowl with rubber spatula and mix by hand. 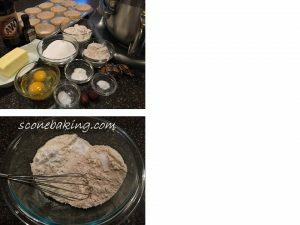 (Do not overmix) Divide batter evenly (using a #12 scoop) among prepared muffin cups (2/3rds full). 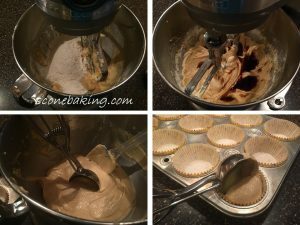 Using a scooper makes getting the batter into the cupcake liners easier. 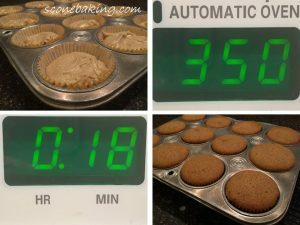 Bake at 350º F., 18 to 22 minutes, until skewer inserted into center of cupcakes comes out clean (internal temp approx. 205 degrees F.). Cool completely. 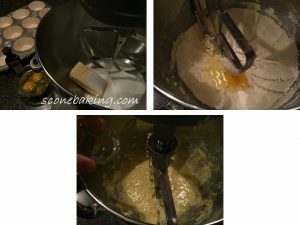 In a large mixing bowl, beat unsalted butter until light and fluffy (5 minutes). Add sifted powdered sugar 1/2 at a time (beating 5 minutes each time, which helps the buttercream get really light and fluffy). 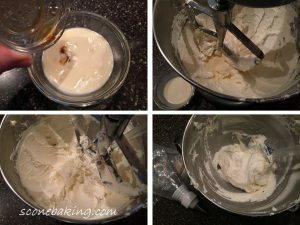 In a small bowl whisk together vanilla ice cream and vanilla extract; add 1/2 to buttercream, beating for 5 minutes; add more as needed to get piping consistency (you may not use all of the ice cream mixture). Fit a 16″ pastry bag with a #1M piping tip. Fill pastry bag with Vanilla Ice Cream Buttercream, set aside. 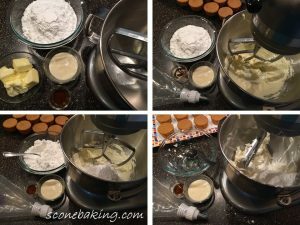 Once cupcakes are cooled, whisk together 2 Tbsp. 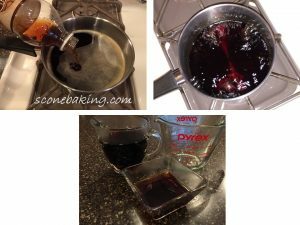 root beer reduction, 1/4 tsp. root beer concentrate, and 1 cup sifted powdered sugar until smooth. Put icing into a ziplock bag, cut a hole in the corner. Pipe Vanilla Ice Cream Buttercream on the tops of the cupcakes. 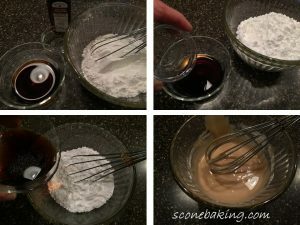 Then add the Root Beer Drizzle on the buttercream (the extra drizzle can be used as a topping on ice cream, root beer floats, etc.). 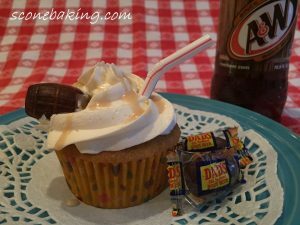 Top each frosted cupcake with 1 Root Beer Barrel candy and a straw (cut to fit).